Finite Element Analysis (FEA) is a numerical technique for finding approximate solutions, widely used in mechanical engineering for various simulations (thermal, electromagnetic, fluid, and structural working environments, etc.) that not only can avoid large costs for prototypes, but helps engineers during their design phases, allowing detailed visualization of where structures bend or twist, and indicates the distribution of stresses and displacements. This powerful design tool has greatly improved the engineering design, and substantially decreased the turnaround for products from concept to production. 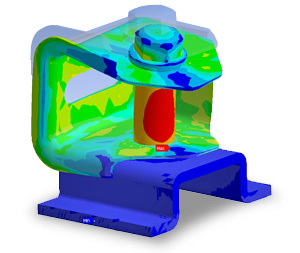 Other benefits of using FEA include increased accuracy, better design and insight into critical design parameters, fewer physical prototypes, virtual prototyping, increased productivity, and shorter and less expensive design cycle. Pro Design Services does not have its own FEA team, but works with several partners that can get such projects done for our clients, so if you need such services, please let us know.